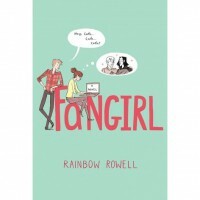 I know it's not fair to compare Fangirl to Eleanor and Park, but after reading Eleanor and Park, I was so excited to read this one. It was so flat I couldn't believe it was written by the same author. I didn't like Cather at all, not even a little bit (even her name reminded me of a catheter) and the rest of the cast was so blah. I didn't like the pages and pages of Cath's fanfic. I was convinced (I still kind of am) that Levi was gay. I think Eleanor and Park is one of the best YA books to come out in a long time, but I can't say the same for this one.